Sole album from this Prague band that had started as far back as the mid-60's and had released seven singles between 67 and 69. Their sole album came in the second part of their career in 72, once woodwind player Kubik and vocalist Misik arrived and changed the group's sound to a sort of hard-driving brass-jazz-rock. By this time Flamengo was a sextet, and until then, they had been fairly well tolerated by the communist regime after the crush of the Spring Of Prague. And for some strange reasons, the regime will ban the album, most likely on the account of the lyric content, which had been written by Josef Kainar and Hynek Zalcyk, both non-members of the group, although the latter was the album's producer and doing a fairly good job sound-wise. This album has now reissued in 98 with a superb reworked booklet including the Czech lyrics and lavish time-themed (or mechanical clock pieces) illustrations and two bonus tracks. If previously fuzzed-out guitarist Frantisek Francl had been the focus of the band, he was gone from the line-up, here Kubik's wind instruments dominate the album (he gets help from two other sax players Kral and Hruska) from the short title track intro with its footstep intro, until the last brass grumbles the second part of the title track closing the album, notwithstanding the two bonus tracks of this Cd reissue. 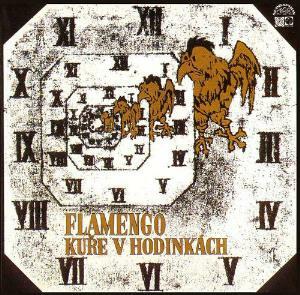 The album's name Kure V Hodinkach means "chicken in the clock". Songwriting-wise the chores are roughly spread out between windplayer Kubik, guitarist Fort and vocalist/percussionist Misik, with keyboard man Khunt also contributing a track, but it would be pretty hard to tell which one would have written which track, because the album stands as a very tight collection of track. This was "released" even if later banned by the second (behind Opus) label of the country: Supraphon. Standing out a bit is the flute-laden acoustic guitar Ja A Dym track slowly evolving into a nice sax-dominated groove, one of the album's highlights. Roughly the other tracks sound much like an Italian Colosseum (Italian due to the singing, mostly) and at times Traffic. The centerpiece (and longest track) Par Stoleti is another superb moment with its outstanding interplay between keys, winds and guitar. The bonus tracks are obviously strongly related to the album (slightly funkier and extra female backing vocals) and are pure added value to the album.